The moment I walk into the 3D Cannabis Center in Denver, Colorado, I'm approached by a security guard, taser on his hip, who requests my identification. As I fumble around in my wallet for my driver's license, I take a look around the lobby and spot at least three different cameras staring right back at me -- and this was after walking past multiple cameras outside just to get in the front door. After explaining that I'm here for an appointment with Toni Fox, the store's owner, I'm issued a badge and asked to sign in before taking a seat and waiting while she's notified of my arrival. Once I'm joined by Fox, I briefly consider asking her if she really believes that this is all necessary, or if she's just being cautious. But within minutes of my conversation with her, she offers a blunt assessment of the situation in which marijuana shop owners find themselves -- suggesting that not only is it necessary, it may not be enough. "It's just a matter of time before one of us gets killed," she says. "It's just a matter of time." Let's rewind for a moment: Starting on January 1, the sale of marijuana for recreational use to persons 21 years and older became legal in Colorado. The sale of marijuana, however, remains illegal on a federal level; it's considered a sale of a Schedule I substance. The real issue? Banks cannot legally perform transactions with businesses that are associated with the Schedule I substances. Some banks are willing to still do business with marijuana dispensaries on a very tentative basis under the store owner's name -- as is the case with 3D -- but there's always a good chance those accounts may be abruptly shuttered if compliance investigations occur. 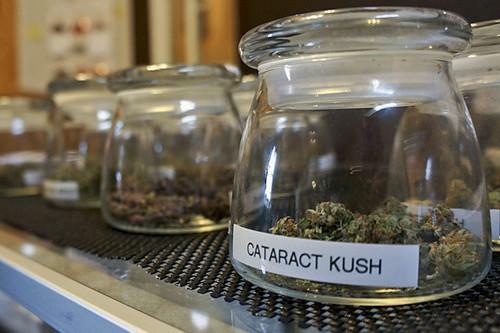 With nowhere to put their money, retail marijuana shops in Colorado are restricted to operating solely with cash. This leaves business owners to fend for themselves as they attempt to protect their businesses, their earnings and, of course, their employees. "We think that this issue needs to be solved now that marijuana is legal in Colorado," says Amanda Averch, director of communications for the Colorado Bankers Association. "In the current state of affairs, these businesses are a public safety affair given the amount of cash in the shops." She also pointed out that that the state cannot appropriately tax businesses for which it cannot follow the money, and that marijuana shops deserve to conduct their legal affairs in a "normal manner" like any other business in Colorado. "Providing banking would be a solution for all of these problems," says Averch. If nothing else, trying to avoid being an attractive target to would-be robbers and thieves costs money. While Fox does not know the exact amount, she estimates that her company spends roughly $5,000 to $10,000 a month on security alone, and that number is only going to increase. "It will just go up. As my sales go up, my security will go up," she says. "Before January, we didn't have security officers. And come March, we realized we needed them 24 hours a day because we were so busy and there was so much traffic flow. I just think the more valuable we are, the more we have to protect ourselves and our assets." As it stands now, though, 3D's security is nothing to sneeze at. Just in case my eyes aren't sharp enough to spot all of the cameras, head of security Kurt Britz -- the guard who initially stopped me at the door -- assures me that there is enough video surveillance to cover "every inch of the store." "We've spent so much on cameras...it's insane," he says. It doesn't take me long to learn, however, that top-notch cameras are far from the only security measure in play here. They're just the tip of the iceberg. As Fox walks me through the 18,000 square foot facility -- the main building is 10,000 square feet, plus another 8,000 square foot wing attached to one side -- I notice staff stationed by certain doors to prevent wandering visitors from roaming into restricted areas. Employees, who are assured by Fox that my picture taking is strictly for professional purposes, walk past us to enter the grow rooms, the doors to which are locked down with numerical keypads. "We have over 40 cameras in the facility, both internal and external...high def, infrared," says Fox as she begins to rattle off 3D's extensive list of defenses. "But we've also got motion sensors, laser beams, break glass sound notifications. And everything is viewable from our phones." Personnel play a large part in the security at 3D, as well. In addition to guard dogs that are frequently on watch -- though they were not present when I was there -- the store has some form of human security present around the clock. "We have a man here all the time, 24/7," says Britz. The security staff, which is managed entirely in house -- Fox says that the company does not utilize the services of any third party security companies -- currently consists of six guards. While their total number may not be particularly impressive, their experience is vast. "I only hire vets, ex-military," says Britz. "It's dangerous...it's a heavy burden to sleep with. It's not for everybody." He went on to explain that guards are then vetted "rigorously" and go through a training program, which includes teaching how to spot fake IDs, as the state does not allow the sale to any persons under 21 years old. The guards also utilize a buddy system to serve as a form of checks and balances, ensuring that everyone watches each other's backs. "I think we're really impervious to robbery because we have so many people on site at all hours of the day and night, and they're in multiple locations throughout the facility," says Fox. "There are cameras watching [both buildings on the store's grounds] so there's always a lot of communication. Everybody has radios, so if something were to happen, the police would be notified immediately." As for the guards themselves, they are currently armed with "almost lethal tasers," though none of them are armed with guns at the moment. But it won't stay that way for long. "We are changing that; all of our security guards will have guns," says Fox when asked about plans for the future. And should worse come to worst, there are panic buttons installed around the store, allowing the staff to hit one in the event of a robbery or some sort of incident. "If there was an ever an issue, we can hit that button and within a matter of two or three minutes, we're surrounded by the Denver PD," says Fox. With such extensive security measures, one might be inclined to think that it's because 3D learned its lesson the hard way at some point, but it's all preemptive; Fox maintains that there's never actually been an attempted robbery at the store. "I would hate to be the person that thinks they could rob us," says Fox. "It won't end well for them. At one point...it was, you know, if somebody comes in at gunpoint, you give them whatever they want. But that is not necessarily the philosophy that we would follow currently." That's not to say that 3D has been completely incident free. The store is located in an industrial area that was victim to a series of break-ins two years ago, including two attempted penetrations of 3D. The thieves came up short, though. "They were on the roof, they had broken some windows trying to get in," says Fox, gesturing to a nearby skylight. "And at every point they tried to enter, a silent alarm went off. And then I had a German shepherd here. So, you know, no fool is going to scale down through the ceiling to meet an angry German shepherd." But unfortunately, the bad guys escaped justice. After tripping a laser and set off the primary -- and not-so-silent -- alarm, they fled. "That's the one you can hear for a mile," says Fox. "So by the time the police got here, there was nobody on site." Thanks to Fox's prior experience and reputation as an established businesswoman, 3D is fortunate enough to have a bank account (in Fox's name) with which it can work. Aside from giving 3D a place to put its money, the account also allows the company to have ADP payroll processing, through which Fox can pay her employees with direct deposit. But not all marijuana shops are quite so fortunate. It ultimately comes down to whether or not banks are willing to operate on a "don't ask, don't tell" basis with stores, and some owners are not able to parlay a deal like Fox's. The CBA, for its part, denies that such workarounds even exist. "Bottom line, it's still illegal at the federal level," says Averch. "There is no decision where banks are deciding...they're not supposed to. If they find out that an account holder is somehow associated with a marijuana business, they have to shut the account. It's too risky and banks can't do it. The only solution to this problem is an act of Congress." In the meantime, shop owners are stuck with mounds of cash, stowing it away into storage units around town and paying their employees with wads of bills. "I've heard what [other shops] do for payroll and it scares the s___ out of me," says Fox. "Stacks of money...and they have to go to the state with stacks of money to pay their payroll taxes! And the IRS, how do you pay them? Money orders. So people are standing in line with 50 grand for money orders, and you have homeless people behind you trying to pay their phone bill." Just because 3D has access to a bank, however, doesn't mean that it's completely safe. The company still needs to transport the cash in mass amounts to the bank, a responsibility that falls on the shoulders of a manager and an armed security officer who either rides along or follows in a separate car. Like upgrading their guards' weapons to firearms, 3D is considering investing in armored car service for the runs, but right now their best solution is to avoid following a routine when moving the cash. "We have multiple methods for transporting our funds," says Britz, who also pointed out that all transactions at the store are to be done in cash, as credit card companies are too skittish to associate with them for the time being. "We have to [move funds] sporadically, at different times of the day, different days of the week, different vehicles, out the front door, out the back door," says Fox. "There is no way that we have a set schedule for any of that." Aside from having to transporting the cash, there are other perilous situations in which shops and their employees find themselves thanks to the cash-centric nature of their business. Fox recalls when she needed to purchase wholesale marijuana from a third party back in February and in order to make the transaction, she had to come up with $100,000 in cash. "It was incredibly uncomfortable and it's just not the way a legitimate industry works," she says. "We have to get banking." But the days of wholesale are over for 3D, says Fox, whose shop now grows enough to sell solely from its own supply. Others, however, still need to rely on third-party transactions and cash pickups from their storage units, putting themselves in danger on a regular basis. "I grow enough now that I sell it, but some people have to deal with that every single day," says Fox. "I know one woman owner and she has four different storage vaults all throughout the city. And every time she has to pay a bill, she's got to go get cash. It's just so dangerous." Though Fox estimates that the company is earning about $10,000 a day (a number she expects to increase given that 3D has made more money in Q1 2014 than they did in their first three years), there's never much buildup of money on site. This, of course, is no accident; the funds are moved out on a regular basis to prevent accumulation. "No, there's never more than a day or two of deposits somewhere in the facility," says Fox. "But again, to get to them, you would have to go through multiple alarms...I just think it would be impossible. Well, not impossible, but it wouldn't be worth it, I can tell you that much." The other concern for stores, then, is worrying about protecting their product. After all, the plants and dried, ready-to-sell product are just as valuable and always on site. "You look at most of the robberies, and most of them are in warehouses, in cultivation facilities," says Fox. "That's what's getting broken into right now, the grows. And it's usually an inside job: some grower or employee got pissed off, they know when a crop's getting ready to come down, and they're breaking in and stealing the plants because they're valuable." For 3D's part, they secure both their plants and their dried sellable products, albeit in slightly different ways. The plants are part of what's monitored by the cameras, alarms, and security team ("In order to get any of my grow, they would have to break through at least three or four alarms," says Fox, who also has monitors at her house to watch feed), but their dried sellable products are locked away in a massive steel room not unlike a bank vault. "And that's very secure," says Fox. "Only three or four of us have the combination for that." Many of these stringent security measures are not by choice, however. The Marijuana Enforcement Division, which is responsible for establishing the rules under which the medical and retail marijuana industries in Colorado must operate, puts forth minimum security requirements that all marijuana shops must meet. One such requirement is that the cameras must have 40 days' worth of backed up footage. "The rule is 20 days of onsite storage, and then 20 days in a backup server offsite," says Fox. "And even where the DVRs are, there has to be a separate camera that's watching that area that's not linked to that DVR, so there's just lots of checks and balances as far as video surveillance goes." No amount of rules and minimum regulations can protect against insider threats, however, are a very real concern for stores like Fox's. The first step to fight them comes in the form of background checks, which are also handled by the MED. This includes criminal and financial background checks, checks on unpaid child support, and even determining whether or not potential employees are delinquent on student loans. "[Employees] have to be badged and fingerprinted through the Marijuana Enforcement Division to work in this industry, and they do extensive background checks," says Fox. "So if there's any issue on any level, there's no way they can get in. It doesn't get much more thorough than the Marijuana Enforcement Division." But 3D takes it upon itself to implement its own measures to prevent any incidents involving its own employees. Aside from having employees agree to take lie detector tests upon request during their hiring process, the company also implements staunch inventory control that is performed three times a day, which ensures that a red flag is raised if something is fishy. "We have a lot of checks and balances on inventory control," says fox. "So sometimes something comes up, but we're on it because we have a balance here that says, 'Well wait, where did those two ounces go?' And then we have cameras that we can pull up and see what the situation is." Employees' loyalty to the company, Fox added, goes a long way in preventing them from stealing either cash or product to sell on the side -- either or on the streets or on the Dark Web. She maintains that any black market dealing done by employees would, in theory, have to be from their grows at home; there's no way that they could steal product from her on a regular basis and she hopes that there's enough loyalty that they wouldn't event think to try. "There's always the concern of insider threats, especially when you're dealing with cash and marijuana," Fox says. "But we just try to hire the most trustworthy people we can and compensate them so that they appreciate their job." In terms of establishing a safer environment, the immediate future looks somewhat bleak for shops like 3D. The Department of Justice has declined to say whether or not there is an impending solution or change to the banking rules, and outside help with protecting marijuana shops is non-existent. There are efforts at the state level to ameliorate the issue, but no solutions have materialized yet. A House bill was introduced last Wednesday that, if passed, would offer shops access to a state-backed (uninsured) financial co-op, thereby giving them access to checking and merchant services. On Thursday, however, Colorado Representative Kevin Priola sponsored an amendment to the bill to study the matter further, thus delaying any potential solution. "Sometimes legislation has unintended consequences when it gets rushed through at the last minute," says Priola, who added that session ends on May 7. "I was just nervous about doing something hastily. Over the next 7 to 8 months, we'll make sure the legislation was the route to go or what tweaks we need to make." Priola recognizes that there's an issue at hand, but he also points out that whatever ends up being done -- including the potential financial co-op idea -- the feds would need to sign off on it. "It needs to be thoroughly thought through and vetted because it will set national precedent," he says. "I understand how much of an issue it is for people in the industry to have to deal with all this cash." But when asked if he believes that marijuana shops should have access to banking, Priola does not offer his opinion, instead putting the onus on the federal government. "I believe that's a question that the federal government needs to make clear for states in general," he says. "Because this is shaping up to be a state versus federal issue. And we need to make sure we honor the law, regardless of where it is." The police, in the meantime, are not directing resources towards protecting stores. Aside from their arrival in the event of a tripped alarm or a phone call -- which is the case with any retail shop -- the Denver Police Department does not coordinate with or offer any additional assistance to marijuana dispensaries. Though the DPD was contacted for comment, a spokesperson for the department deferred to the mayor's office, saying that it was the "proper channel" to go through for comment. The mayor's office, in turn, did not respond to repeated requests for comment. When I mention this to her, Fox says she isn't terribly surprised. "[Denver Mayor Michael Hancock] has been nothing but a complete, difficult pain in the a__ for us," she says. "So he's not going to give you any feedback." Needless to say, Fox isn't especially optimistic about local government making any pushes to address the banking issues that marijuana shops face. "Hancock doesn't like us, he thinks we're trash," says Fox. "He thinks we're drug pushers and that marijuana is a gateway drug. He's a knucklehead, and you can quote me on that."